Leasing a new trade show exhibit can be a sound business decision with impactful short and long term benefits. 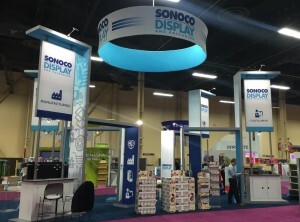 If you have specific exhibit marketing requirements, and would like a completely unique look for your next trade show, Watson Productions offers a custom trade show exhibit lease program that provides you with an effective marketing environment while controlling overall costs and improving your ROI. Our team will work with you to design and build a brand new exhibit, based on specific functional, marketing, and design criteria that you identify. *Up to 6 months followed by 36, 48 or 60 months of regular lease payments; you will own the equipment once all payments on the term are completed for an additional one dollar; minimum transaction size is $10,000 up to $250,000. We provide services throughout the US including major cities such as New York, Chicago, Dallas, Orlando and Los Angeles. Let us handle all phases of planning for you. Email or call us at 516-334-9766 ext. 310 to find out how to lease a custom exhibit.